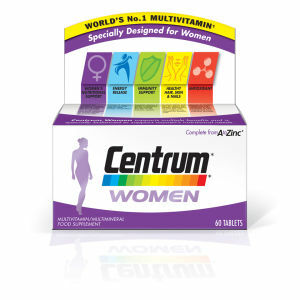 Centrum Women 50 Plus Multivitamin Tablets have been specifically developed to support the changing needs of women’s health and wellbeing over the age of 50+, delivering tailored levels of vitamins and minerals for optimum efficacy and benefits. Adjusted amounts of Iron and Vitamin D support changes in energy levels and environmental reactions over time, with Vitamin B6 helping to regulate hormonal activity post-menopause. B Vitamins help to release food-based energy for an overall boost, plus Vitamin C, Zinc, Copper and Selenium work in tandem to support the immune system. High levels of Calcium and Vitamin D maintain strong bones. Age gracefully with this daily food supplement that provides all the resources you need to keep you feeling in your prime.